In Lorient, Brittany since 31st March, the BMW Oracle team have just completed a 10 day sailing session aboard Franck Cammas' Groupama 2 trimaran this Friday. During this training period a dozen Anglo-Saxon racers were able to discover the pleasures of sailing, which were as intense as they were enthralling. Their main aim is to win the 33rd edition of the America's Cup, which will be contested in multihulls. "It was great for all of us to sail on a large boat and make good progress in our multihull sailing skills. 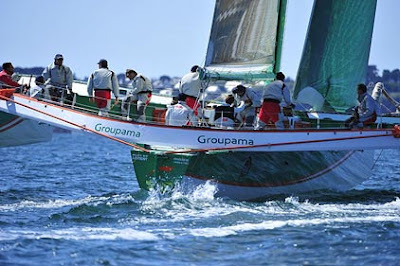 The Groupama team knows the boat like the back of their hand. We sailed in all kinds of conditions, from light wind with flat seas to breezy conditions with big seas and it was fantastic to see that Groupama 2 always performed well" commented James Spithill, helmsman on BMW Oracle sailing team. After an initial week spent on our own so as to learn how to sail a multihull, Groupama 2 did battle with the Banque Populaire IV trimaran for three days: "We worked a great deal on the starts as well as the manoeuvres on some short courses. We learnt more than we'd hoped" said tactician John Kostecki. "We saw that we still had a lot to learn if we want to be ready to race later this year".